[SOLVED] How can I fix my terminal when editing the PATH in .bash_profile has the startup hang and I get no prompt? Thanks bmike.i will try to do that. My bash_profile has so so many stuff.IT will be tuff. BTW where should i put the new "export PATH="/usr/local/sbin:$PATH:$GEM_HOME/bin" in bash_profile? In the begining or in the end? my bash_profile is filled with so many code with PATH=".....' is it possible that i delete everything except the new line "export PATH="/usr/local/sbin:$PATH:$GEM_HOME/bin""
It's also critical that you remove from the cat << EOF ... line through the EOF on a line by itself -- every time that runs, it adds another batch of garbled mess to the end of the .bash_profile itself. Frankly, I think it'll be easier to dump it, and start over (see my answer). Are you still using Visual Studio Code? If so, I'd keep just the last two lines of what I have above. If you're not using VS Code, just remove the .bash_profile entirely (but keep a backup, just in case). PATH should be automatically set to a reasonable (but basic) value without the file. If you do need to set it for some reason, PATH=/usr/local/bin:/usr/bin:/bin:/usr/sbin:/sbin is the original default, and I'd recommend using that. BTW i removed my previous SQL path [export PATH="/usr/local/mysql/bin:$PATH"], If i want to add it again to my bash_profile (otherwise MYSQL dont run for some reason) what should be the safe code? 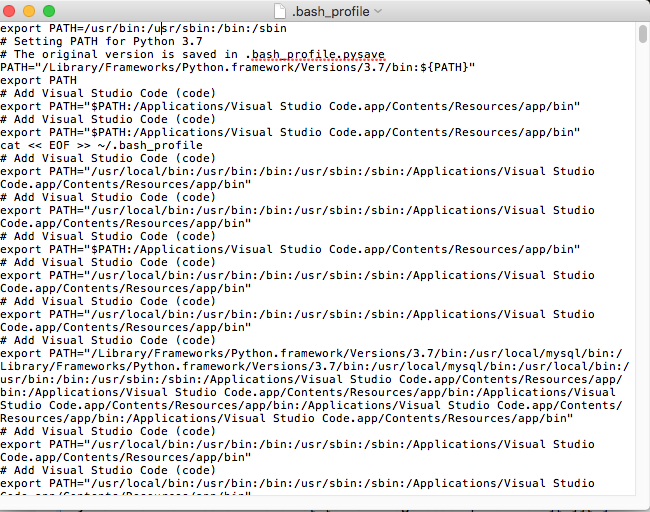 Adding export PATH="/usr/local/mysql/bin:$PATH" to your .bash_profile is fine. As bmike said in his answer, it's the entries that don't include $PATH on the right side that cause problems. Essentially, an entry like this adds to the PATH, while one that doesn't have $PATH on the right side is replacing the PATH (deleting all the other additions that're already there). Adding things to PATH just increases the list of places the system will look for command files, which isn't a big deal. [SOLVED] When I type 'echo $path' in Terminal, I see only a blank line - why? [SOLVED] Unable to locate an executable at "/Library/Java/JavaVirtualMachines/jdk1.8.0_144.jdk/Contents/Home/bin/apt" (-1)? [SOLVED] How do I change the path that is being searched for launching an application?